Celebrate U of M Libraries Day – Monday, July 17! 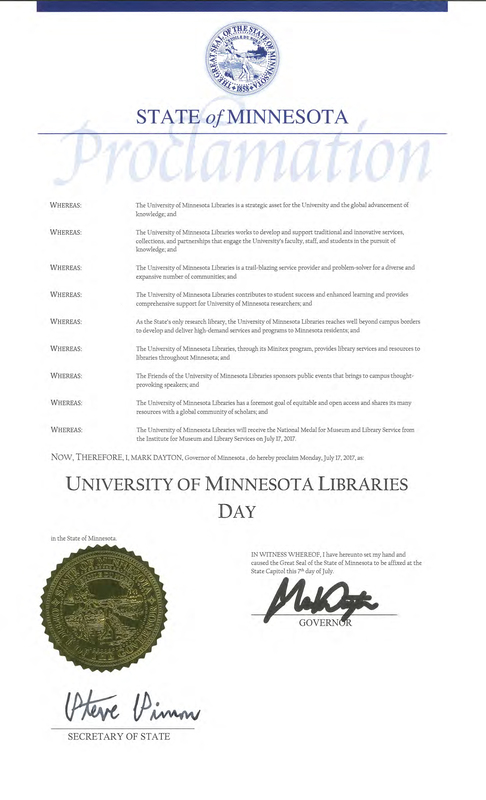 Sincere kudos to the University of Minnesota Libraries on the occasion of not one, but two, honors. First, the Libraries were honored with the 2017 National Medal for Library Service from the Institute of Museum and Library Services (IMLS). (https://twin-cities.umn.edu/news-events/u-libraries-named-recipient-nations-highest-museum-and-library-honor) The Libraries were nominated for the award by the Friends of the Libraries Board. The Medal will be awarded on Monday, July 17, at the National Archives in Washington, DC. Journalist, writer and radio commentator Cokie Roberts will present the award. Dr. Kathryn K. Matthew, Director of the Institute of Museum and Library Services will officiate while David Ferriero, Archivist of the United States, will deliver remarks. Dr. Matthew and Friends of the Library Board President Margaret Telfer will represent the U of M Libraries at the award ceremony. The Medal Ceremony will be streamed live at 2:00 pm on Monday, January 17. It’s Spring! You’ve stashed the boots and parkas, gathered the tax information, and got out the seed catalogs. Do you feel the need to transform yourself, your life, your surroundings, political system, your outlook? Have you thought of a visit to the library? Turns out that National Library Week 2017 is Sunday, April 9 through Saturday, April 15 – and the theme is “Libraries transform.” Though I guess you can interpret that any way you wish, as I see it this era of alternative facts suggests transforming our ways of seeking and appreciating truth might be an appropriate transformation…. And libraries, particularly those that value an informed public over stats and optics, are actually an essential resource. And yet I would suggest that it’s not libraries but the multitude of people who support, work in and value libraries that do the transforming. That includes staff at every level, library boards, Friends, volunteers of every stripe. As with every institution, libraries themselves are being transformed, largely because of information and communications technology – basically by the ways in which people seek, acquire and assess information. In an earlier era some thought technology would replace libraries. As time has demonstrated, the role that libraries play is more essential than ever. The challenge is well-nigh overwhelming for all involved. Which means that a pause to recognize and celebrate is more than ever timely. One starting point may be the American Library Association’s annual “State of America’s Libraries Report” scheduled to be announced on Monday. On Tuesday, April 11, focus is on the people who connect the resources of the library with seekers of information, ideas, inspiration, real facts. Wednesday, April 12, is National Bookmobile Day. Though it may sound anachronistic it’s important to bear in mind that broadband access is far from universal and that there are far too many people with disabilities, lack of transportation or other challenge for whom bookmobile service is their only option. The American Library Association, sponsor of National Library Week 2017, provides written and graphic promotional materials in abundance. To download free NLW tools and resources visit http://ala.org/nlw. Or check other sources, including Pinterest, for library-related graphics. Finally, bear in mind that transformation takes time, so focus on the long view on the “Libraries transform” theme. Libraries have been transforming users and their communities of interest since about 2600 BC. No rush – just a pause to appreciate and celebrate. April 9 through 15: Come join us! The University Libraries invites you to join us for National Library Week, an annual event occurring this year from April 9 through 15, which celebrates libraries and the people they serve. “Libraries Transform” is this year’s theme, and the U Libraries will be hosting events that help transform lives on our campus. Helping our staff and students meet basic needs through a food drive that assures everyone can focus on lifelong learning, rather than where their next meal is coming from. In addition, the Libraries transforms by providing our campus with resources and services that address the needs of today and tomorrow — from publishing services, systematic reviews, data management and immigration history to a new researcher collaboration studio opening in Wilson Library fall 2017. The University Libraries will be outside across campus during National Library Week! Stop by our booth to check out some great reads, and see what else is going on at the Libraries! On behalf of the Food Group, the University Libraries will host a donation site for non-perishable food items. Donation sites include: Wilson, Walter, Bio-Med, and Magrath Libraries from April 9 through April 15. You can also join the fun from home! Share your library story using #nlw17 and don’t forget to tag the University Libraries (@umnlib). Share how libraries have transformed your papers, research, projects, and perspectives. Follow us on Facebook, Instagram and Twitter to see our events and resources that help transform the lives of our faculty, staff, and students. Please contact Jamie Hoehn (jlhoehn@umn.edu) or Kristen Mastel (meye0539@umn.edu) with questions.